This mining town nestled on a rocky plateau, is located on the border of the provinces of Manitoba and Saskatchewan and owes its name to a curious character of a science fiction story called Josiah Flintabbatey Flonatin. In the image above we see the statue near 7 meters high erected by the inhabitants of the city in his honor. History tells us that the first explorers who came to the area in early 20th century in search of gold, possessed as the only entertainment a copy of the novel The Sunless City and decided to call the newly discovered place using a contraction of the name of his main character. Later in 1929, when arrived the railway, to name the train station there was used that denomination, transforming Flin Flon in the only city named in such a unique way around the world. During great part of the 60's decade, Flin Flon was choosen to perform many stratospheric balloon launches as an extension of the Skyhook Churchill program carried out under auspicies of the Office of Naval Research of the US Navy. As its very name indicates, the program was based on the Churchill Research Range facility, located on the coast of the Hudson Bay. 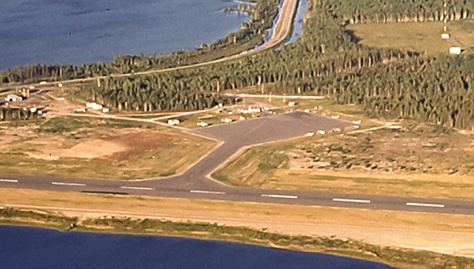 The balloon launches performed from Flin Flon used as base the installations of the Municipal Airport, located in Bakers Narrows about 20 kms southeast of the city. The launches were performed from three different places: the aircraft parking ramp which measured about 400 ft with a smooth blacktop surface, the airport runway or -less frequently- the extensions of grass in their sides. The airport had a low frequency of flights, with only two airline passenger stops per day, so balloon launches were programed to avoid interference with these. The flight campaign were planned and coordinated with the Winnipeg offices of the Canadian Air Authority which also arranged special daily weather soundings of the Canadian Weather Service to 100.000 ft (normal height was 50.000 ft) for the duration of the campaign. All materials were transported in the Great Northern Railway from the Minneapolis area to Winnipeg, and once there moved to Flin Flon by Canadian National Railroad. Depending if the payloads launched were meant to be recovered or not, the operations included the use of float planes. 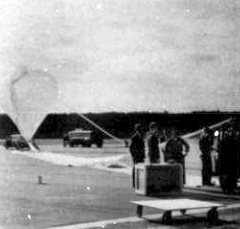 The task of the planes was to track balloons from launch to the termination point, to spot and record the payload's impact point, and later to land on the nearest water spot and proceed on foot to recover it and bring it back to Flin Flon. Main scientific user of the Flin Flon balloon flights was the research group of Dr. Kinsey Anderson at the University of California which sent aloft on the flights particle counters and detectors to study the cosmic radiation. According to the records, the first launches were performed in 1961 and were repeated each summer until the last campaign carried out in 1966. 9/7/1966 4:36 utc 4 h X-RAY COUNTER Winds picked up at launch and the gondola struck the ground and dragged 100 feet.